Snack on unique seasonings such as coconut curry Thai, Mexican spiced cocoa, and Moroccan harissa lime. Spices have a history as rich as human civilization, traveling on the backs of camels, on ships across the Indian Ocean, and traded for large sums of gold. 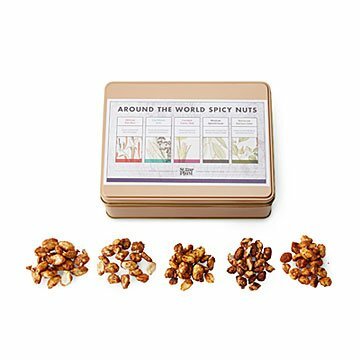 When you savor this collection of wordly peanuts, the sweet and spicy blend swirls with each satisfying crunch. Nosh on five unique seasonings including: Caribbean jerk, coconut curry Thai, Mexican spiced cocoa, Moroccan harissa lime, and African piri piri. A great gift for grazers and those with taste buds that enjoy new adventures. Made in Pennsylvania. Neil Edley didn’t choose the sweet life, it chose him. Since he was 15 years old, he's been operating a confections business with his mother Frann in Northeastern Pennsylvania. Neil is still dreaming up innovative culinary ideas as their business continues to grow. Willing to experiment with any combination that comes to mind—whether it’s bourbon caramel pretzel chocolate or Caribbean jerk peanuts—his team specializes in custom-made products. Neil perfected his craft at renowned culinary college Johnson & Wales, and continues to expand upon his knowledge and creativity by making the best chocolates and nuts possible. His hope is that his confections provide the world with a little taste of happiness. Good variety of flavors. Nice pack in snack size. Unique and fun for all of us! Ordered as a gift for husband. First delivered tin box was damaged. Im'd customer support who took care of everything and got me a replacement tin within the week. Husband hasn't tried the nuts yet, but I am sure they will be great! We have never been disappointed with anything we have purchased from Uncommon Goods. Our entire family have ordered gifts from them over the last 3 - 4 years and will continue in the future. Great company -- great people. We love the different flavors. Bought this for my grandmother who lives out of state. She loved the nuts and said the bags were surprisingly very full... not just filled with hair like some snacks. She was happy to show off this gift to guests. My wife loved this gift! She talked about the freshness of the peanuts, and the array of spicy tastes from several nations. She reiterated her pleasure each time she dug into a new bag. The set was a great creative gift for my dad. One big flaw was that the top label of the box was placed terribly crooked. This took away from the perceived quality of the product. There was also a lot of packaging material that seems wasteful. My dad was thrilled with the gift. He enjoys spicy food, and he said he really enjoyed the variety in this selection. Thanks for providing just the right item for a unique present!